We’re excited to announce that an updated version of the Geode Connect app is now available on the Google Play Store. As a configuration and communication utility for the Geode Sub-meter GPS Receiver, Geode Connect provides users with the ability to establish communications with the Geode, change receiver settings, and view position, altitude, estimated horizontal error, differential status fix information, speed, heading, satellites in fix, and PDOP. 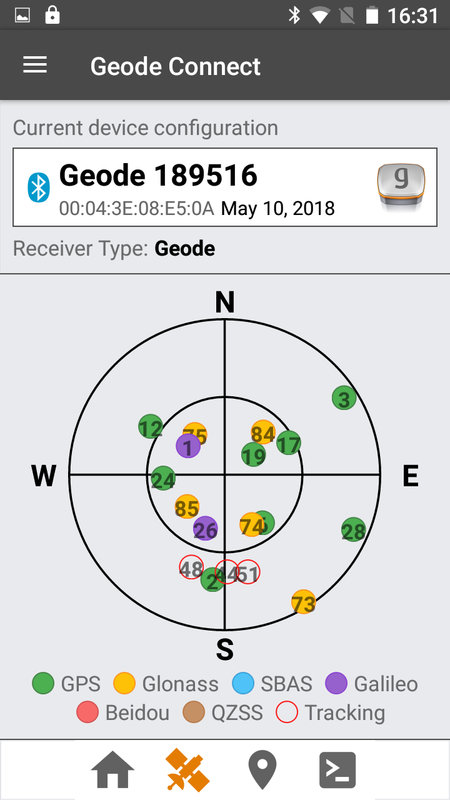 With added benefits including multi-GNSS support, NTRIP support, point capture, improved menus, and improved mock locations provider functionality, the Geode Connect app is prepared to optimize your workflow and make communication with the Geode Sub-meter GPS Receiver seamless. Multi-GNSS Geode models now support Galileo and Beidou constellations in addition to GPS and GLONASS. With a recent update in firmware, the Geode will now support additional satellite constellations to increase reliability of an already accurate solution. This basic function allows users to replace your device’s internal GNSS receiver to the Geode high precision external receiver. With this update, an improved mock locations provider functionality has been implemented for use with Android apps that depend on location services from the operating system. In addition, Issues with the mock locations provider check box have been fixed. NTRIP networks can be used to provide RTCM3 corrections to the Geode Sub-meter GPS Receiver. Using local RTK/NTRIP networks, users can expect to achieve expected accuracy (or better) where satellite-based corrections (SBAS) are unavailable. 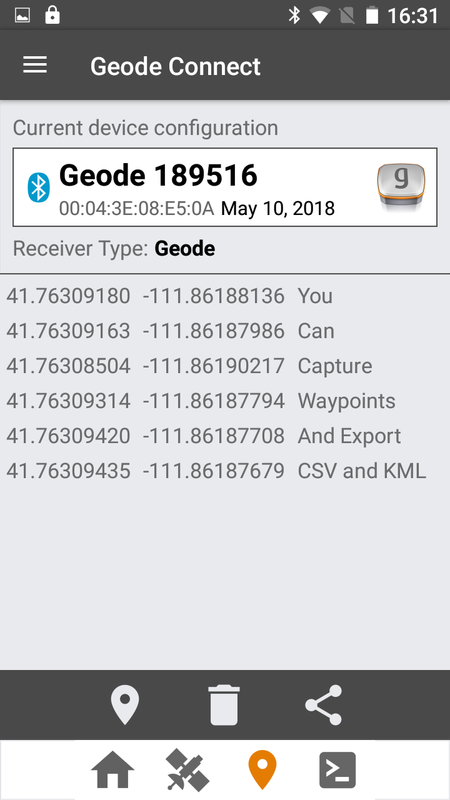 Geode Connect for Android now provides the ability to demonstrate point capture and export captured data as a .CSV or .KML file. This feature provides users with the ability to validate the accuracy of the Geode without requiring the use of a third-party app. Based on user feedback, menus have been moved to reduce clicks and keystrokes. As a regular update to sustain the health of the app, unnecessary or outdated settings and commands have been removed to improve user experience. Designed with versatility in mind, the Geode Sub-meter GPS Receiver provides precision GNSS data without the high price tag and complexity of other precision receivers. The Geode Connect app mimics this mission with its user-friendly interface and compatibility with multiple operating systems. Is it really possible to get a sub meter accuracy with a hand held device without post processing or without connecting to Cores. Yes, it is possible for the Geode to achieve sub-meter results with real-time WAAS corrections. The Geode can achieve 60 cm 2DRMS (95%+) horizontal accuracy when it has WAAS corrections. OF course, the Geode can also be used as a post-processed solution with EZTag CE and EZSurv data collection and post-processing software and data from CORS receivers. Screenshot with skyplot shows two Galileo satellites. Is available any newer Geode firmware which supports Galileo? Hi! Geode receivers now support Galileo satellites, and support for Galileo is in Geode Connect Android. Other versions of Geode Connect (PC, Windows Embedded Handheld) will be updated to display Galileo satellites soon. Older Geode receivers with the serial port can upgrade the internal firmware to include support for Galileo, Beidou, QZSS (future). Thanks for reaching out. It sounds like your app isn’t retrieving data from Android’s Mock Location Provider service. Check the location settings in the operating system to ensure the location setting is on GPS Only or Device Only. Also, check whether your apps have direct receiver connection capability or if they rely on location services from Android. Otherwise, we’d love to assist you more. I’ll be reaching out. Thanks!